“I feel blessed,” might not be what you’d expect to hear from a 44-year-old woman who has lived with multiple sclerosis for more than half her life. But when Carrie McCure says it, she means it. In 1997, at the age of 23 and with a 1-year-old, Carrie was diagnosed with multiple sclerosis, a chronic disease of the central nervous system, in which the body attacks the fatty tissue that protects nerve fibers. Her mobility declined over the years until she needed forearm crutches. Then, in 2010, a new brain lesion put her in a wheelchair. That’s when she started to see Dr. Dennis Garwacki at the OSF HealthCare Illinois Neurological Institute Multiple Sclerosis Center, designated a Center for Comprehensive Multiple Sclerosis Care by the National Multiple Sclerosis Society. Vicky Schwegmann, RN, MSCN, with the OSF HealthCare Illinois Neurological Institute Multiple Sclerosis Center care team, along with Carrie McCure. Despite her condition, Carrie’s list of blessings is a long one. She has a van she can drive with hand controls. A church group installed a ramp to the entrance of her house, and another one installed a roll-in shower in her bathroom. Plus, growing up around MS has helped her two daughters develop into caring people. Included among those angels: the OSF INI multiple sclerosis team. 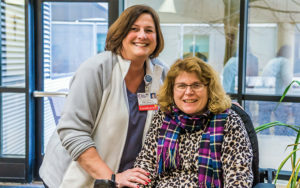 In 2017, Carrie’s care team connected her with the Central Illinois MS Council, whose goal is to improve the quality of life for the region’s MS community. The MS Council bought Carrie a power seat actuator, at a cost of more than $3,000, so she can elevate without leaving her wheelchair.